My brother was over here not too long ago, and he was talking on the phone with his girlfriend. Nathan, being the outgoing little social bug that he is, was dying to talk to her as well. 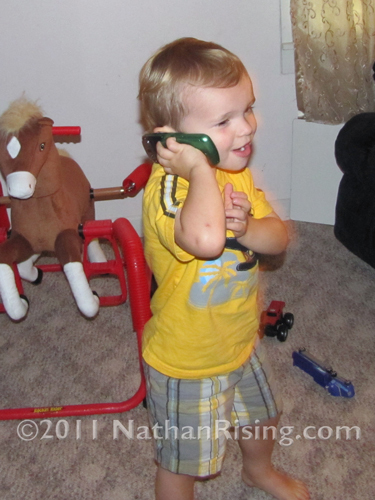 (As you may know, Nathan loves talking on the phone!) Even though he’s never met her, he carried on a conversation with her and even “showed” her his room (by taking the phone away from his ear, aiming it towards his room, and turning it in a slow circle.) She was a good sport and talked to him for a while. Nathan walked around the house, talking and talking. And then? When my brother finally took back the phone and said his good byes, he gave the phone back to Nathan. Nathan didn’t care that no one was on the other end of the line; he continued to talk his little heart out. This entry was posted by Jen on October 25, 2011 at 10:43 am, and is filed under Oh the things Nathan does. Follow any responses to this post through RSS 2.0.You can skip to the end and leave a response. Pinging is currently not allowed.